Want a SUP to take you far? Want to be comfortable on your journey? The Expedition is one of the best as far as touring boards go. 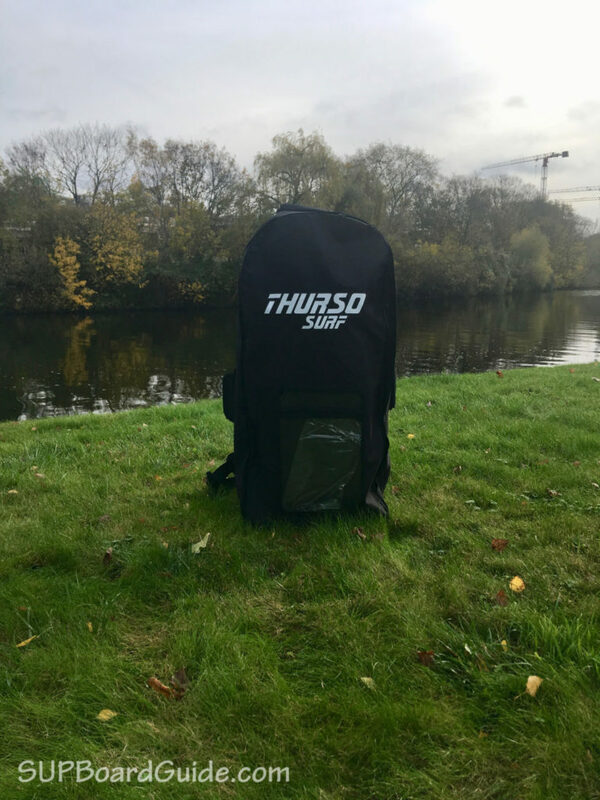 It’s the same super high quality we already know from the Waterwalker 11′ and Waterwalker 10’6″ that Thurso released in 2016 and 2017 and also comes with the usual 24 months warranty. That means you can buy with full confidence but more on that later. If you are looking to move fast and freely on the water, the Expedition is for you. The size of the board means once you have gained momentum you’ll be cruising, happier than a duck in the water. Another point to notice with the length of this board is that it’s meant Thurso Surf was able to keep the width of your standing area to a maximum. Other boards that are shorter and intended for speed tend to take on an egg shape. The 11’6″ length means that you still have 30” width for stability but a streamlined design for speed. Note: The board is not fully inflated. That’s why it looks slightly “wrinkly”. Manoeuvrability is a dream too with the narrow tail. For beginners, this can be a bit tricky to get used to as it’s a little sensitive to wobbles. Though it’s more than worthwhile to feel those wobbles out! We love that the fins are all removable too. Taking it out on the flat river meant a dream-like state paddle. Using just a center fin for optimum speed and tracking, you’ll love cutting through the water like a knife through butter. If you need to make some more controlled, tighter turns, chuck those side fins in! A nice balance of rocker means there’s give for rougher conditions but not so much you lose momentum. Comparing it to the All-rounder Waterwalker again the Expedition you’ll see only a slightly higher rise in the rocker. So we argue that if you are a bigger rider with experience, you’re better off purchasing this Expedition for adventure than the 11’ Waterwalker. Beginners, use the side fins initially. They may slow you down a little but they add extra stability to the back of your SUP and that at first should be your priority! A combination of sturdy materials and intelligent manufacturing makes the Expedition feel as rigid as your hardboard. 6” thickness and double layered PVC over drop stitching innards promise your rigidness as well as durability. Thurso Surf uses the same materials across their whole range. It’s so good that even bigger riders won’t notice any flex, especially on this whopping 11’6. The high-quality materials are the reason the Expedition is still light despite being a fairly long paddle board. Thurso claims it weighs just 26lbs which is great for a board this size. 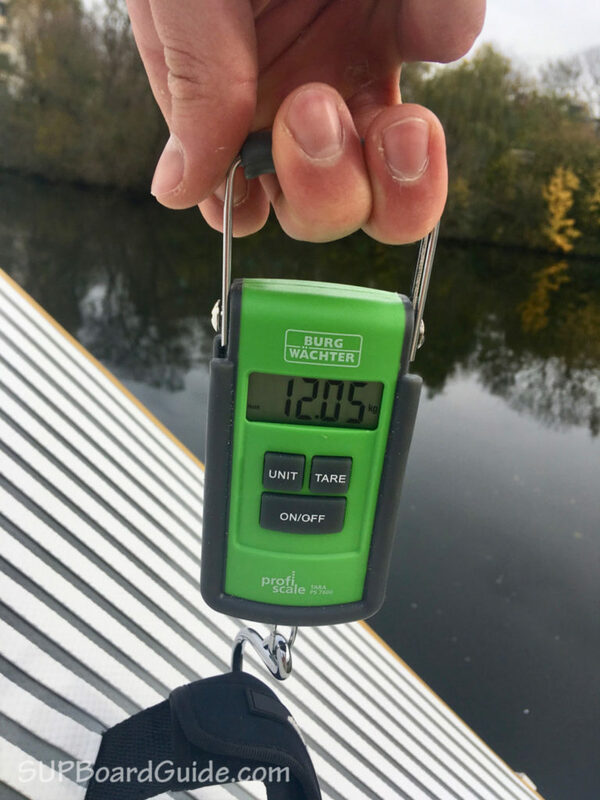 When we test boards, we always double-check the board weight. The Expedition does live up to its claims weighing just 12kg (26.4lbs). We are so happy to see Thurso Surf making all the fins removable on their newer boards. It does make a big difference as you grow into your SUP. It gives you the option to grow with your board. Toolless insertion/extraction too! As we talked about in the performance, the three fins can be played around with for whatever conditions you are in. Single fin for tracking and cruising or three for better maneuverability (or stability for the beginners). 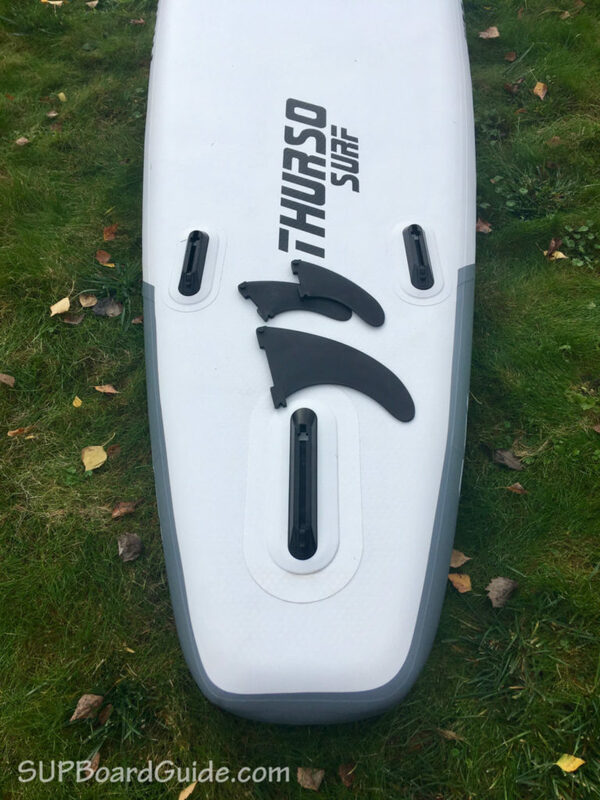 The same thing as we mentioned in the Waterwalker review the fins are Thurso Surf’s own product, so you have to source replacements from them. Though with their killer customer service this should hardly be an issue. In 5-10 mins depending on how gung-ho you are at pumping you’ll have your Expedition fully inflated at its recommended 15 PSI. Getting the job done is the included premium quality high-pressure pump. The pump is one of the best we’ve seen in inclusive packages. It’s a double action pump which means you can switch back to single pumps to lessen the resistance in your pumps as you get into the higher PSIs. You’ll find it much easier! It also has a deflate option which is super convenient. It helps you get the last bit of air out of the board making it super easy to roll up and store in its bag. Much like the rest of the line, the standout wooden deck design leaves purchasers satisfied. Many reviewers state people remarking on thinking it’s a real wooden board when they’ve been out on the water. And it happened to us too!! Not only is feeling like the cool kid a good ego boost, standing out is a safety concern in crowded areas. If you are using your Expedition anywhere around boats, they’ll much quicker spot you than if you were on a dull color board. Featured on the top of the board is also some room to secure and store anything you want to bring along. Maybe minus if it’s your spouse or children. They should probably sit on your feet (and they can, it’s plenty big enough!). On that note, let’s look at the deck area. It would be better to see the non-slip deck pad stretched the back of the board. Though the area it covers is still substantial and provides an extremely comfortable platform for sitting, kneeling…head standing? The center handle now opens up too! So, you can secure your paddle there and go hands-free. 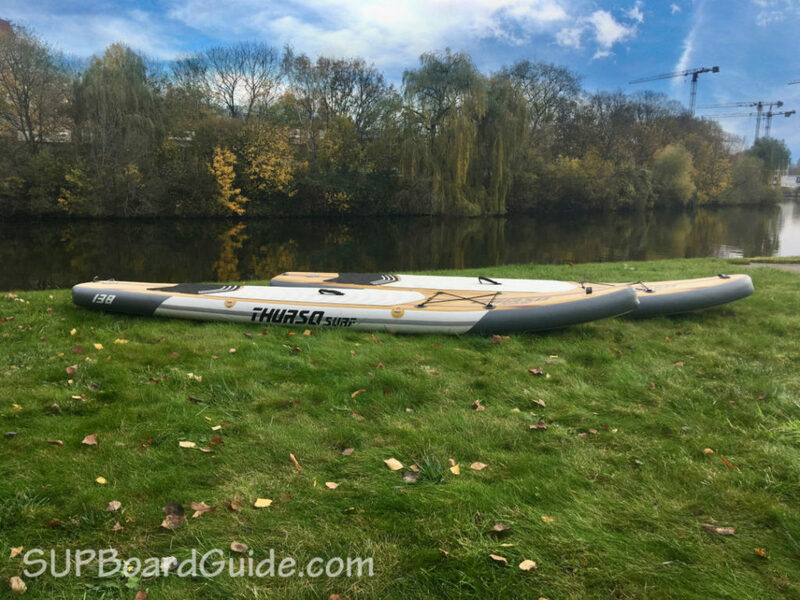 If you’ve already heard about Thurso Surf accessories in prior reviews, breathe easy knowing they still want to include them for the Expedition. The bag which we cover more of further down is phenomenal which makes for easy transportation. As we see with the Waterwalker, the Expedition also has the new handle on the nose. It’s useful for pulling the board out of the water, being towed (if you’re lucky!) and as an extra carrying point for a two-person carry. This is where most inclusive packages let you down. On the paddle. Heavy, flimsy things. But, surprise surprise that’s not the case here! It’s not a surprise, Thurso Surf accessories are some of the best. It’s a 800g carbon fiber (shaft only) floating piece of wonder and excitement. Grasping it in your hand and pulling through water you’ll notice minimal flutter and easy strokes. It breaks down into three pieces for convenience and so far no reports of slipping in the joints when paddling. Given the lightweight nature of the paddle, you’ll be out for hours before your arms still to feel heavy. If heaviness gets the better of you and your paddle is dropped, it’s okay – it floats. Adjust the height to whatever you need with ranges of 61”-82” and safely secure your length with the simple snap-lock system. By taking out the middle piece, you can now insert the paddle blade straight into the handle end and you have a small paddle. Perfect for the kiddies or beginners who prefer kneeling! Time-lapse! It’s the 40’s and curls are in. What on earth does that have to do with a leash? The previous Thurso Surf boards included a straight leash, but now we’ve had a makeover from straight to a coiled leg rope. Coiled leashes won’t spring your SUP back at your head as fast and they store easier. Also, this leash is another reason to love this company. It’s so imperative to your safety to have a leash. At Thurso Surf, they care. Baaaack it up. Thurosurf from the day they began included an outstanding bag. You see, most companies start out supplying accessories that are passable. Not excelling, just passable. Not Thurso Surf, they went all out and it’s worked. So what are they bags highlights? FULL support. We are talking back, waist and shoulders. Comfortable enough for longer hikes with your SUP. Plenty of room for all your gear and even a little extra space! What would a Thurso Surf package be without your extra gift? 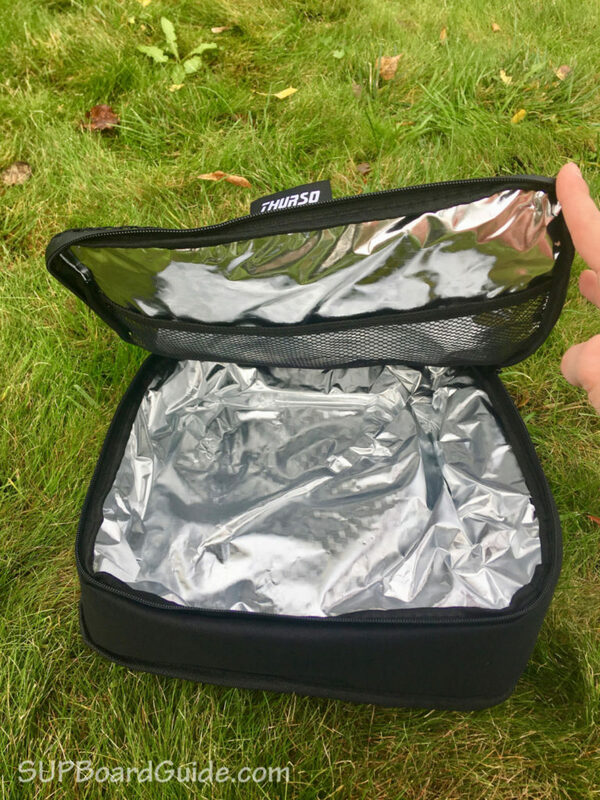 Of course, just like all the other models, you get your insulated cooler bag to take with you on your adventures. It fits snuggly under the tie downs on your deck. So long as you’ve got a little experience or willing to be patient, you’ll LOVE this board. It’s easy to build and gain momentum to satisfy the speedy urges. And you’ll feel comfortable doing so as it’s as stable and rigid. This SUP is made for somebody that wants to go fast and cover some distance. 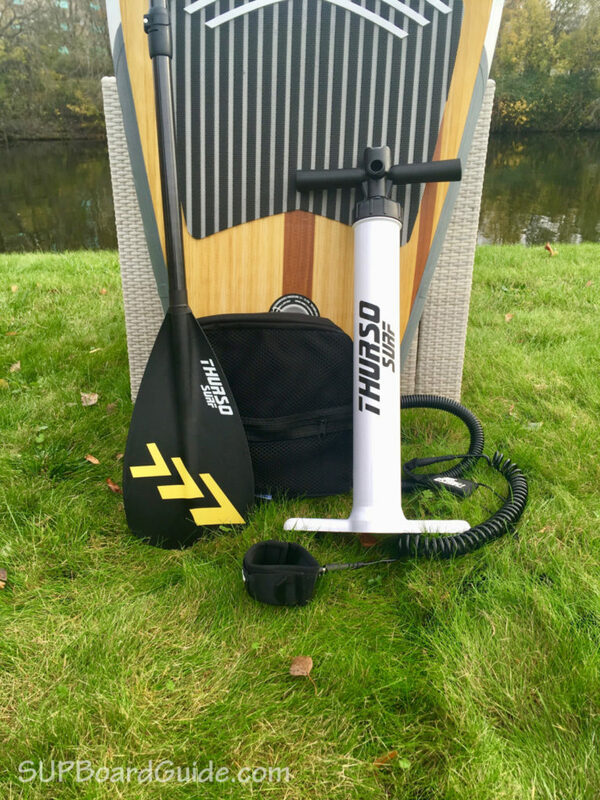 Ideal for lakes or flatwater but also great in slightly choppy conditions. It’s not a beginner board, but advanced paddlers will love it. The 330 lbs weight capacity makes it perfect for long trips allowing you to bring more than enough gear for a day-trip. Durable – Yes! Affordable – Yes! Versatile – Yes! Looks super cool? – YES! Okay, so there has to be a catch somewhere right? Well, we do think the deck pad could be stretched back further, but that’s about it really. 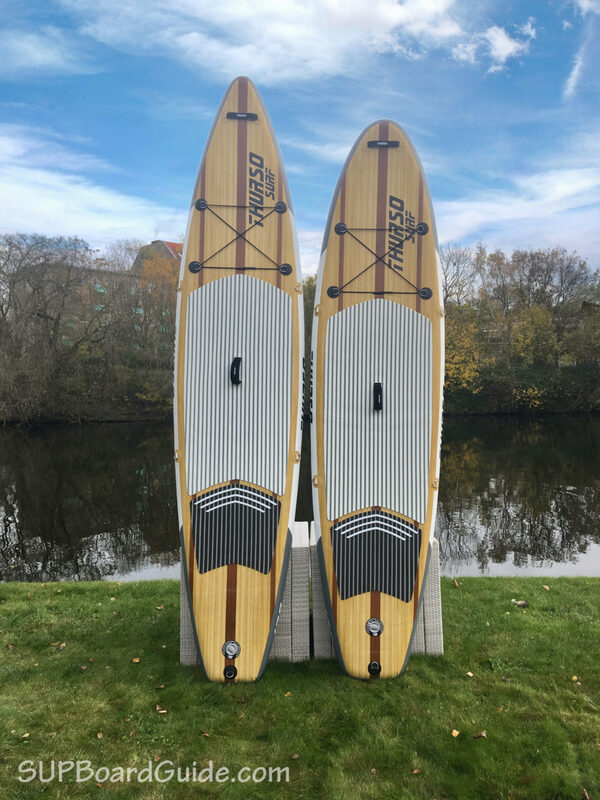 If perhaps you are intimidated by the length you can check out their 10’6 or 11′ WaterWalker, it’s not as fast but still a great option for a paddler with little experience. Now if you are looking to buy your child a SUP and want to be really cute by getting matching boards, you should look at the Thurso Surf Prodigy Juniors board. It’s also rated highly by us for its performance and quality. They don’t drop the ball just because it’s your kids! The only thing we can think of that this board doesn’t do is surf. If you are looking to surf your SUP, again the Waterwalker 10’6 or the Nixy Newport will be a friendlier option. Please let us know if you have purchased any SUPs from Thurso Surf, it’s an exciting activity watching this brand grow! Thank you very much for this pre-release review! 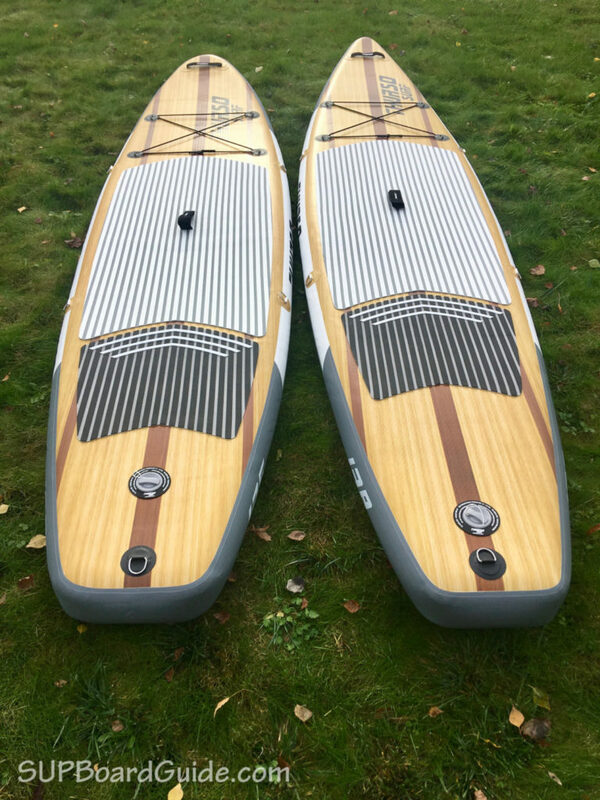 As a happy owner of the Thurso Surf 11′ Waterwalker, I’m looking forward to the Expedition being released and being able to take it on adventures that the Waterwalker isn’t quite designed for. I love the look of the wood deck and get many compliments on it, and I want something similar in a well performing touring isup. Any indication of a release date? There, unfortunately, is no fixed release date yet. The boards are in production and Thurso is aiming for an early summer release. Not yet, unfortunately. We will update you as soon as Thurso releases an update. I’m trying to decide between the Thurso Expedition and the Starboard Touring. 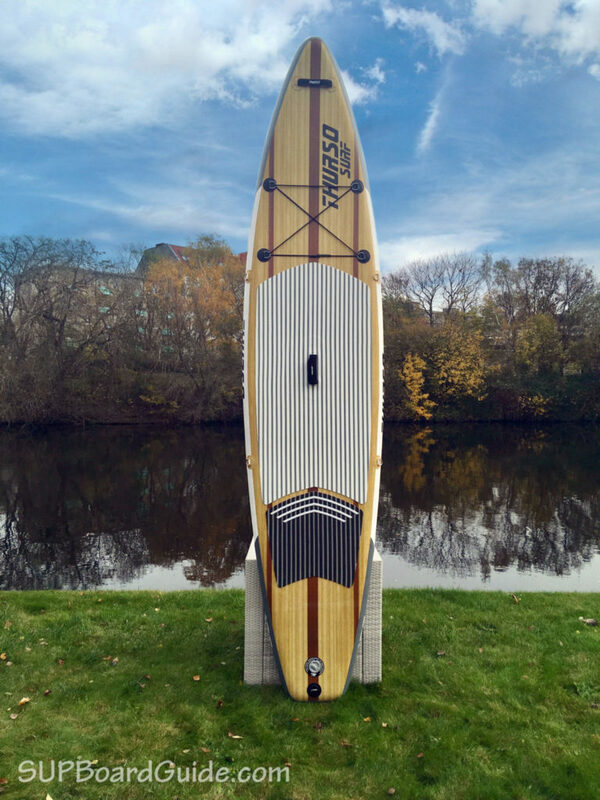 Do you think the Starboard is worth the extra money ($500). 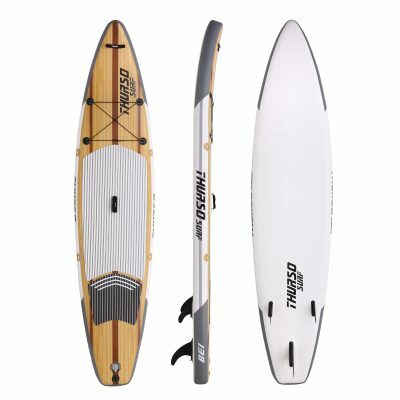 I’m looking to use the board for an occasional race but also for general use on lakes/reservoirs. if you want to use the board for races you ideally want to buy a hardboard. If that’s not an option spend the extra $500 on the Starboard. It’s the better board and you will notice that it’s faster. 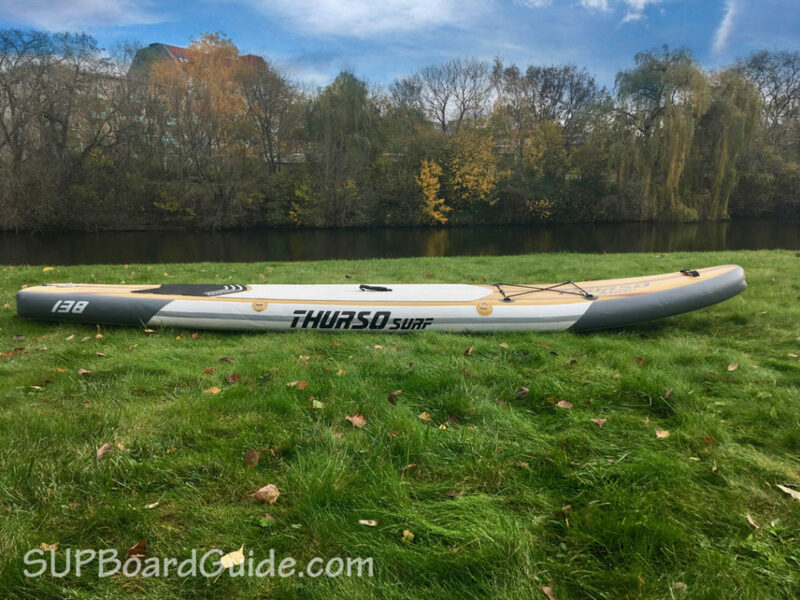 The Thurso is great for casual paddling but it’s not a board you want to use in a race. The company should improve the joint locking system. Sorry to hear that. It’s a known manufacturing issue that happened in the second generation of paddles. It’s since been fixed. 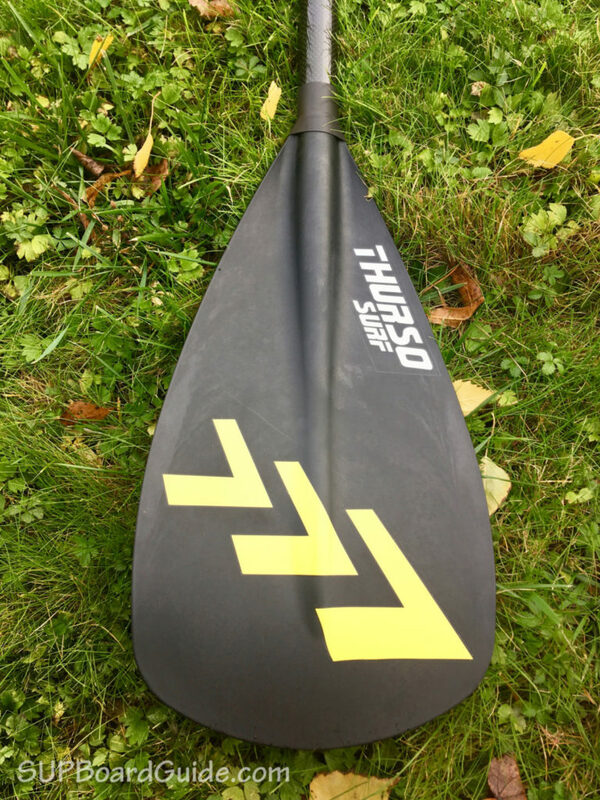 If you contact Thurso directly they will send you a free paddle free of charge though so don’t buy a new one! I’m a 90 kg (180lb) experienced hard-board open ocean paddler; never owned an inflatable though. IF YOU HAVE DONE SUP CAMPING ALREADY, I’d love to hear your board recommendations. I will be SUP camping mostly on mellow rivers. The Thurso Expedition is not what you’re looking for. It doesn’t have the cargo space and will leave you slightly disappointed if you’re used to hardboards. It’s hard to beat the Bote Traveller. Bote specializes in touring and fishing boards and their products are super high quality. The Traveller is 12’6 so a good touring size and at 30″ width and a streamlined design, you can cover long distances. Check out the video on this site.